Flow cytometric analysis of NIH/3T3 cells, untreated (blue) or treated with recombinant mouse PDGF-BB (200 ng/ml, 10 min; green), using Phospho-PLCγ1 (Tyr783) (D6M9S) Rabbit mAb (PE Conjugate). 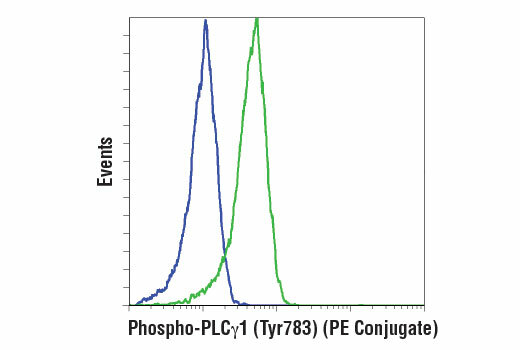 Phospho-PLCγ1 (Tyr783) (D6M9S) Rabbit mAb (PE Conjugate) recognizes endogenous levels of PLCγ1 protein only when phosphorylated at Tyr783. Monoclonal antibody is produced by immunizing animals with a synthetic phosphopeptide corresponding to residues surrounding Tyr783 of human PLCγ1 protein. This Cell Signaling Technology antibody is conjugated to phycoerythrin (PE) and tested in-house for direct flow cytometry analysis in mouse cells. The antibody is expected to exhibit the same species cross-reactivity as the unconjugated Phospho-PLCγ1 (Tyr783) (D6M9S) Rabbit mAb #14008. Phosphoinositide-specific phospholipase C (PLC) plays a significant role in transmembrane signaling. In response to extracellular stimuli such as hormones, growth factors, and neurotransmitters, PLC hydrolyzes phosphatidylinositol 4,5-bisphosphate (PIP2) to generate two secondary messengers: inositol 1,4,5-triphosphate (IP3) and diacylglycerol (DAG) (1). At least four families of PLCs have been identified: PLCβ, PLCγ, PLCδ, and PLCε. Phosphorylation is one of the key mechanisms that regulate the activity of PLC. PLCγ is activated by both receptor and non-receptor tyrosine kinases (2). PLCγ forms a complex with EGF and PDGF receptors, which leads to the phosphorylation of PLCγ at Tyr771, 783, and 1248 (3). Phosphorylation by Syk at Tyr783 activates the enzymatic activity of PLCγ1 (4). PLCγ2 is engaged in antigen-dependent signaling in B cells and collagen-dependent signaling in platelets. Phosphorylation by Btk or Lck at Tyr753, 759, 1197, and 1217 is correlated with PLCγ2 activity (5,6). Singer, W.D. et al. (1997) Annu Rev Biochem 66, 475-509. Margolis, B. et al. (1989) Cell 57, 1101-7. Kim, H.K. et al. (1991) Cell 65, 435-41. Wang, Z. et al. (1998) Mol Cell Biol 18, 590-7. Watanabe, D. et al. (2001) J Biol Chem 276, 38595-601. Ozdener, F. et al. (2002) Mol Pharmacol 62, 672-9.